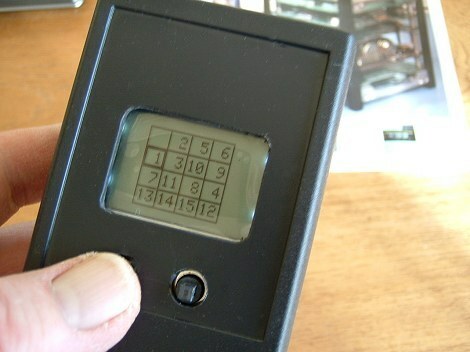 To use up one of my spare Nokia 5110 LCD displays. I seem to have aquired quite a few! To have a play with the ATmega328 in PowerDown mode. In PowerDown mode, the entire circuit uses about 18uA of which about 2uA are taken by the voltage regulator. To try the MICROCHIP - MCP1702-3302E. This is a very low dropout 3.3 volt regulator so a 9v PP3 used to power the game should be good down to about 3.5 volts at the 7mA current used by the game. In addition, it has a very low quiescent current - typically 2uA. It started off as the simple 'classic' 15 puzzle in which the numbers 1 to 15 are placed in a 4 x 4 grid pattern and have to be arranged in numerical order by moving each 'tile' into the empty square. It became apparent that the free memory in the ATmega328 could be used for additional games which could be played with the same type of 5-way navigation switch. The version of 'Game-Set' presented here incorporates the 15 Puzzle (shown in the photo at the top of the page), Minefield, Lunar Lander and a very poor implementation of Draughts (checkers). Porting them across to Game-Set and particularly to the relatively small Nokia 5110 display proved to be a bit of a challenge. As games go, by modern standards, they're pretty useless but it was fun building the project in time for Christmas! I'll begin with the construction and then, as there is very little space on the Nokia screen to display decent game instructions, I'll deal with the software and how to 'drive' it from the users' perspective. The circuit is powered with a 9v PP3 battery regulated to 3.3 volts with the MCP1702-3302E very low dropout regulator. 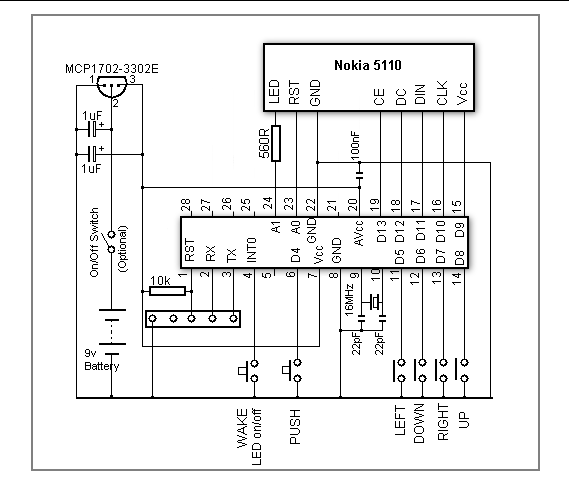 The software is designed to put both the ATmega328 and the Nokia 5110 display into Power Down mode after 60 seconds of inactivity when the current consumption drops to only 18uA. It's, therefore, debatable whether an on/off switch is required at all but I included one just in case! Switches Left, Down, Right, Up and Push are a 5-way Navigation Switch from CPC. Their datasheet isn't very helpful with regards to the pin-out but there's a better datasheet here. The Wake/LED switch is a conventional 6mm tactile switch. It's connected to the ATmega328 INT0 pin as it's necessary to use an interrupt to awake the chip from its full Power_Down mode. If the ATmega328 is powered down, pushing the switch will awaken it. If it is already awake, pushing the switch will toggle the Nokia backlight on and off. All of the inputs have their internal pullup resistors enabled in the software to simplify the PCB layout. Although using external pullups instead would pare a few extra microAmps off the power down current, I didn't consider it worthwhile. The largest saving in power down current is achieved by disabling (in software) the ATmega328 ADC circuitry. Pins A0 and A1 are used as digital outputs as they're on the more convenient side of the ATmega328 for the PCB layout (besides there only being one spare Digital I/O pin on the other side anyway). 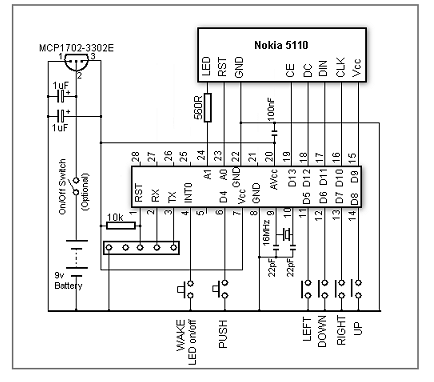 The Nokia 5110 Vcc supply and its LED backlight are connected to ATmega328 output pins to allow it to be powered down with the ATmega328. The ATmega328 Reset, Rx and Tx pins, together with a ground connection, are brought out to a header for use with an external programmer, if required. This site and its contents are © Copyright 2005 - All Rights Reserved.